When Thad Harris was a child, he was once held down in a bed of fire ants by those who tried to send a message to his mother, who was active in the Civil Rights Movement. But neither Thad nor his mother are the type to be held down for long. Though a 2001 truck accident cost him the use of his legs and confined him to a wheelchair for the rest of his life, Thad wasn’t interested in a handout. The Fuller Center for Housing offered him a hand up. Like any other Fuller Center homeowner partner, Thad was required to perform hundreds of hours of sweat equity in helping to build his home. And he did. Thad logged well over 500 hours of sweat equity in building his home and was as effective as anyone on the construction site thanks to his drive and his previous building experience. And he pays it forward perhaps as much as anyone, logging hundreds of hours a year helping others obtain affordable home ownership and repairing existing houses. 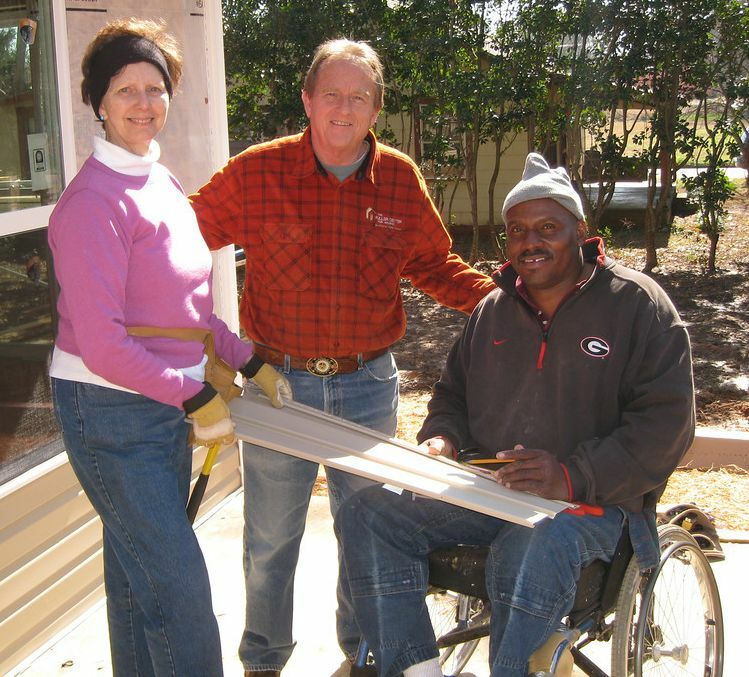 Thad has found joy in having an energy-efficient house that is wheelchair-accessible, in meeting and marrying his wife, Leala, during the building process and in helping others be empowered as he has been. We see that joy all the time. And we want to share Thad’s story with you because it’s just one example illustrating our belief that a hand up is more effective than a handout. If you share our belief, please consider donating in Thad’s name or volunteering with us. Thank you! Read a letter from Thad, thanking those who support The Fuller Center. Gold Energy Star rating pays off in low bills for Fuller Center homeowner. Read about a build day on Thad Harris’ home, one year after Millard Fuller’s death. View photos of Thad Harris working with The Fuller Center as a homeowner partner and as a volunteer. CLICK HERE TO DONATE IN THAD’S NAME!